Have you looked at your tile and grout lately? Have you noticed that your grout lines are darker than they used to be? Does your tile look dingy and impossible to clean? Getting on your hands and knees to clean your tile and grout is always an option but it is back breaking work and will not get your tile to the true definition of clean. Instead of breaking your back just call a professional like Beyer Carpet Cleaning. Getting your tile and grout back to it’s original state is a true restoration job that Beyer Carpet Cleaning offers it’s customers. 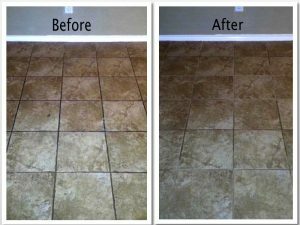 Tile and grout cleaning san antonio isn’t always the easiest or cheapest to have done especially if you have multiple rooms covered in tile; however, it’s totally worth it! The tile and grout cleaning Beyer Carpet Cleaning preforms involves a heavy duty alkaline cleaner or sulfamic acid cleaner. The Beyer technicians spray this cleaner onto the tile and grout and scrub it in to bring all the dirt and grime to the surface. Each grout line and tile is carefully scrubbed in order to ensure everything that can be removed from your tile and grout is removed. Once your tile and grout is scrubbed really well with the cleaner a big heavy duty rounded steam cleaner is brought in to remove the cleaner, dirt, and grim from your tile. 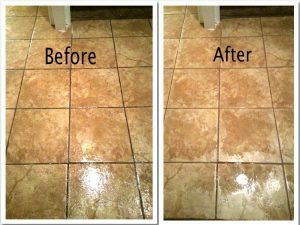 Once your tile and grout is thoroughly steam cleaned and everything has been extracted your tile and grout will look just like new. The professional tile and grout cleaners have the equipment and the right products to use to clean so it isn’t as strenuous and doesn’t take as long to clean. Within a few short hours you will have the tile and grout you’ve been missing. Beyer Carpet Cleaning offers the lowest price in San Antonio for professional tile and grout cleaning. They are also willing to work with you on price if you have a substantial amount of tile and grout that needs cleaning. Beyer Carpet Cleaning is here to offer the best so they are willing to do what it takes to provide the best. Call Beyer Carpet Cleaning today (210)723-4392 and you won’t be disappointed.